Start with the panna cotta: place the water in a small bowl and sprinkle the gelatin on top. Set aside for 5 minutes or until gelatin absorbs the water. Combine the buttermilk, cream, icing sugar and rose water in a saucepan over medium heat and stir until sugar has just dissolved. Add the gelatin mixture and cook, stirring, for further 1-2 minutes or until gelatin is dissolved. Strain into a jug and allow cooling. Divide mixture into six 2/3 cup (160ml) capacity glasses or ramekins and refrigerate for 2-3 hours or until set. Make the jam: preheat the oven to 180°/350°F. Place the blueberries, sugar and lemon juice in a small ovenproof dish and mix to combine. Bake for 15 minutes or until berries release their juices and mixture is bubbling. Cool completely. Top each panna cotta with the jam and serve. ** this jam is absolutely delicious with vanilla ice cream, too. Interesting combination for a panna cotta! I've never made one before but I'm getting there :) thanks for sharing! 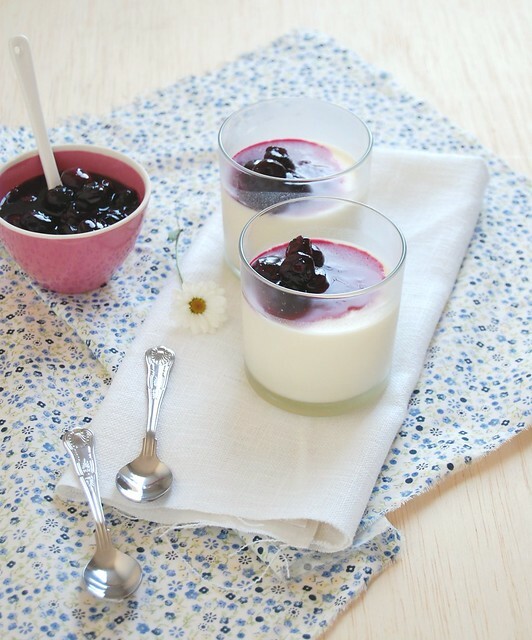 Now your panna cotta with fresh blueberry jam looks amazing, as everything you make. I love panna cotta, but I haven't tried with rose water yet. Another one of your recipes for me to try and I'm sure I won't be disappointed. cool! i have some rose water at home, i have to try it! That sounds so interesting. I wonder how a nut milk would work. Looks lovely! So beautiful... love the flavor combo..
Beautiful and wonderful pannacotta,especially love that jam.. Baked blueberry jam? What a revelation! Also, I love rose water, so this recipe is doubly exciting! Merci! I made this last night for one of our "family dinners". Mixed reviews. Blueberries were fantastic, panna cotta was perfect, but the rose water freaked some of us out. It was like eating rose scented soap from Grandmothers house. I'm not saying it wasn't good, because it was, but just really strange. I am thinking of trying this next time with some orange blossom water as I have had this before in gelato and enjoyed it very much. Thanks for a great website, I love your insights, obsessions and recipes!! Thank you for your feedback - I believe that maybe there is some difference among rose water brands? Mine was pretty light regarding flavor. But I appreciate your thoughts on the recipe. I think that you would love using vanilla instead of rose water! Your comment made my day! I'm so glad to know you're enjoying it here. i love blueberries and this sounds like a refreshing combination. and great photo, by the way!